I have considered doing a Bonnie Hunter mystery quilt for many years now, but joining just before Christmas was a hindrance. I have folders on my computer of a couple of the PDF’s from years gone by, hoping that I would make it during another part of the year, but without the deadlines and community, never started them. One year I even tried to get some quilter friends to do it with me, but was not convincing enough. This year, someone posted about it in a Facebook group I am active in, and I decided that this was the year to just do it. It really helped the decision that when the paint swatches came out, they were all colors that I had in my scrap bin or my stash, and using much of that fabric was priority. So… I have taken the plunge, and I am glad I did! It actually is a nice break at the end of the day to go to my sewing area and work on something rather mindless. Bonnie has done all the hard work, and each week you are just doing the same block, in the same way, over and over. This is Week Two of actual sewing, and I would think it would be quite possible to jump in now and still keep up. All the information and the free downloadable PDFs are on Bonnie Hunter’s website. In one of her posts or instructions, she gave “permission” (Let’s face it… some personalities need to get permission! 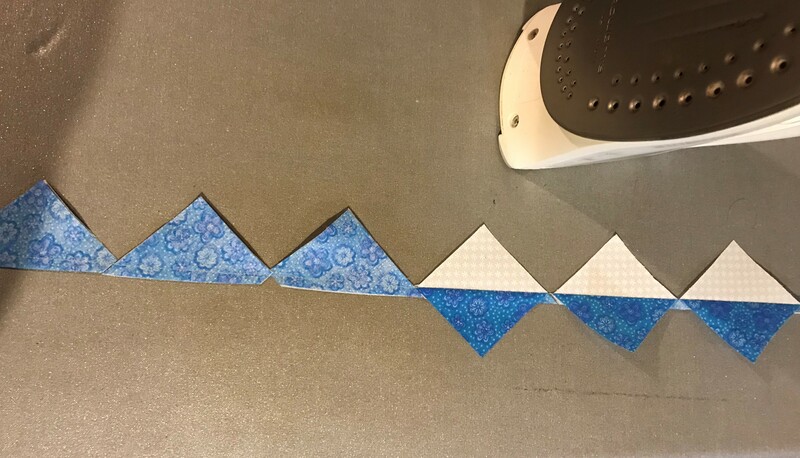 🙂 ) to do part of the blocks and make a wall quilt, or do part now and catch up later. I thought that was probably what I would end up doing, but I actually get a little caught up in it and go farther than I expected. So far I have completed all of the Week One blocks (the red and neutral ones) and almost half of the Week Two (blue and neutral) blocks. Week Three instructions come out Friday, so I plan on being done with these by then. Bonnie’s instructions are very good, and even though I am an experienced quilter, I am learning time saving and accuracy tips. Another plus is that at least the first couple of blocks are small pieces. I have been able to use some fabric that needed to be cut very small to look good and get them out of my stash. I plan on posting weekly updates of progress on here, but I realize that as it gets closer to Christmas it may be fewer pieces than needed, and I will have to catch up later. I would love it if you would join along! Previous post: Our Kits are Now Available at The Sewing Connection!